The Tree House is proud to announce its first author event. 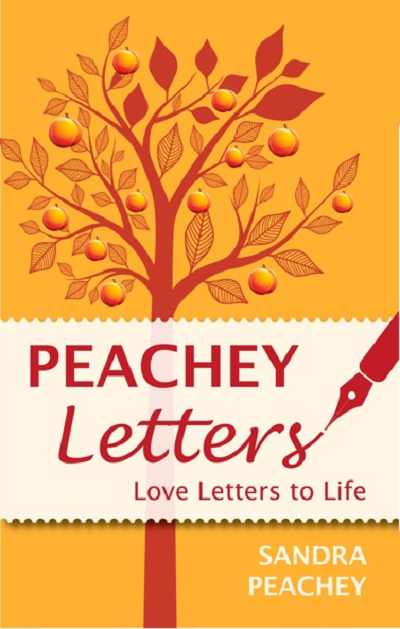 On Friday 11th October, Coventry-based writer Sandra Peachey will be talking about her book, Peachey Letters, and the process of letter-writing as a healing, cathartic, revelatory way of coming to terms with our lives. Letter-writing is seemingly out of fashion in these days of emails and texting, but Sandra has found letter-writing to be a powerful means of exploring ourselves and our experience of life. Sandra says, “The book is really an extension of this initial writing process, after I saw how it not only transformed my life, but that of the people who read my letters too. I want to encourage people to resolve issues in their own lives, live beyond their past and embrace their future. I want to show people that they can follow the same simple process as I have, to heal, reconcile and celebrate their lives”. Tickets for this event are £3, including tea/coffee; doors open at 7.30pm for an 8pm start. More details on our Facebook page. The wonderful Virago Press is 40 years old this year. They have produced so many fabulous books – novels written by women that have been rediscovered, as well as new novels by contemporary writers such as Margaret Atwood and Sarah Waters. I am a rubbish feminist, but I am deeply grateful for the work they have done in getting neglected women writers back into publication. My life would have been a lot poorer without the input of EH Young, Elizabeth Taylor (not THAT Elizabeth Taylor…), Rose Macaulay, Vita Sackville West and many others. I love the dark green covers of the older publications – and we have a lovely collection of them in the shop. 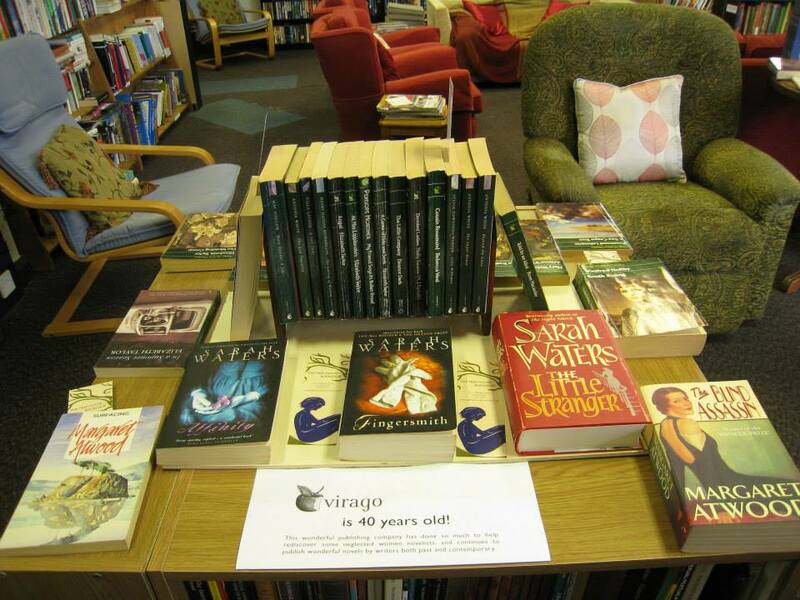 So I have made a table of them, to help celebrate 40 years of this great publishing house. There are now a few more titles there since I took the photo – but also a couple that have been sold! 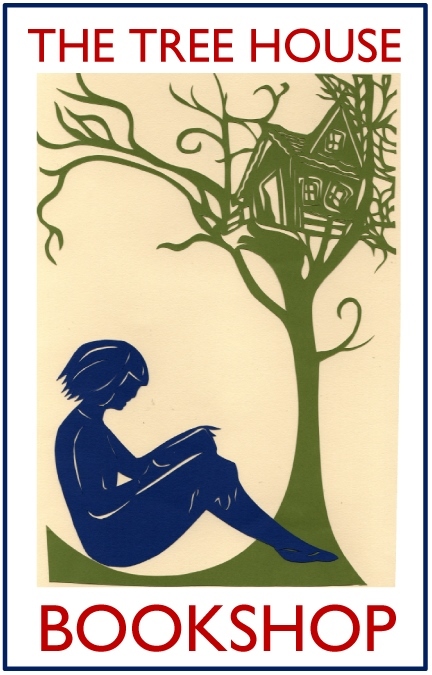 The Tree House is sadly closed on Wednesday this week, as I have to go to Oxford, but when it reopens on Thursday, do come and have a look at the Virago selection, and if you haven’t read one of these wonderful authors before, this is your chance. All the books are £2 – but you are also welcome to buy a cup of coffee and sit and read on one of the sofas. The Tree House is a reading room as well as a bookshop – but of course we hope you will enjoy the books enough to want to buy them and take them home! My problem is that Saturday is by far the busiest day in the bookshop, and losing a day’s trading will be a major blow to the shop’s precarious financial situation. So I am wondering if there are any of you out there who might be prepared to help keep the shop open on that day. You wouldn’t need to do all day, but if anyone could offer an hour or two to cover even just the afternoon (it’s busier in the afternoon than the morning) that would be wonderful. I can pay you in books! I also still need volunteers for Thursdays, to avoid having to close the shop another day on a weekly basis – so again, if anyone can help at all, I’d be very grateful to hear from you. I have never been to Scarthin Books, but it is one of the most influential bookshops in the development of the Tree House. Once I had begun to think about opening a second-hand bookshop, I was looking at other bookshops on the web, and came across this video for Scarthin Books, and it contains so much of what I would love to achieve. They sell new books as well as second-hand, and have a proper cafe, neither of which I am planning at the moment; but in terms of the bookshop itself, its ethos, its aesthetic, its quirkiness amid the order, it’s what I aspire to for the Tree House. Do watch this wonderful video, it really is a joy. Well, finally there is tea and coffee on offer again at the Tree House. The verdict so far is that the coffee is excellent! No one has tried tea yet. The coffee is made with beans freshly ground in the shop; there is decaffeinated coffee on offer, but that is ready-ground. Tea is ‘ordinary’ or Early Grey. Both are served in cafetières, £1.50 for a small one, £3 for a large one. There is also herbal tea at £1 a cup. I am in talks with a local baker to supply cake – will let you know when that is available! So if you fancy a cup of good coffee, and a sofa to sit on while you drink it, and a plentiful supply of books to browse with your coffee, and free wifi…the Tree House Bookshop is the place to come. 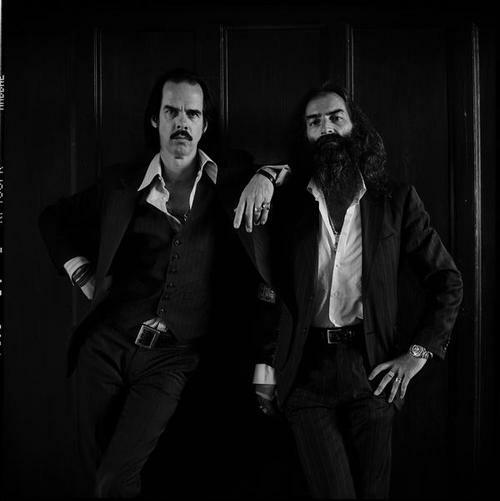 Here are Johnny and Bob Dylan (a few pictures of him in the shop too!) singing You Are My Sunshine together. RIP Johnny Cash. The bookshop is usually closed on Tuesdays, but thanks to a volunteer called Phil, it will be open today – normal hours, 10am-5pm. Thank you Phil! Also a reminder about two events happening on the same day at the end of the month – a Macmillan coffee morning, and a gig by Sutton Coldfield band English Jones in the evening. Both on Friday 27 September – see the Events tab or the Facebook page for more details. If anyone can offer a nice raffle prize for the Macmillan event, do please get in touch! Sweet As have offered tea and cake for two, for example – prizes like that, or any sort of prize, would be great. Any offers of cake to sell would also be very welcome. We will also have handmade cards for sale, and Ernie Boxall of Balance Fitness and Health is offering Shiatsu sessions. Again, any offers of other things to raise a bit of money are welcome. If local people could spread the word about both events, and encourage people to follow this blog (which is now the website for the shop too), that would be great. Thanks to everyone for continued support and, in some cases, exceptional kindness.